Tight on cash this season? We’ve found the perfects gifts for the fashionistas on your list- all items $35 or less! Essie’s winter 2010 collection creates an aura of mystique with a vision of wintery beauty that is darkly decadent and supremely elegant. This 4 piece mini collection includes these fun hues: masquerade ball, silken cord, hot coco, going incognito. A limited-edition ensemble of fiercely stylish cosmetic bags. 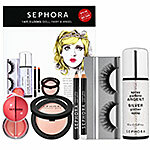 This range of chic makeup bags fuses attitude with function, to hold every aspect of your beauty arsenal. Four sizes and shapes, all featuring black faux leather and edgy studs, will get you organized and accessorized at the same time. Echo has combined two of their best selling styles from last year to give you the new and improved ruffled Echo Touch glove. 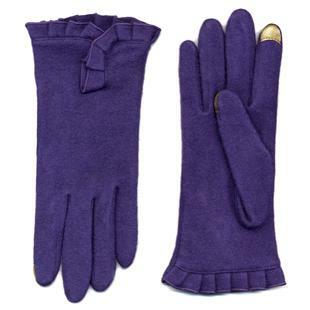 Keep your hands warm while you keep in touch! Echo Touch gloves are engineered specifically with the new wave of technology in mind. Adhered to the index finger and thumb of each glove, our eLink fabric interacts with touch screen devices, making them compatible with the iPod, iPhone, iPad and other touch sensitive digital devices. Made of wool blend. These mini shades contain a healthy infusion of 100% pure bareMinerals and a blend of exotic oils, botanical extracts and protective antioxidants for long-lasting hydration, superior shine and shimmering color – all without any stickiness. Plus, they’re keychain-ready, so you’ll always have your lucky lipgloss at your fingertips. Are you seeking studs? 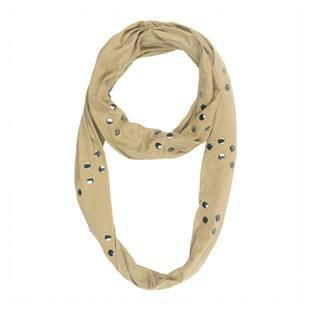 Echo’s studded scarf ring is trend appropriate and also looks great with any casual outfit. January 31st – the one day it is acceptable to adorn more sequins and glitter than you can ever imagine. This year, don’t forget to match that sequined mini with a sparkling shadow or liner. Glittered lids were seen all over the 2009 runways – and not just in the typical silver and gold shimmer. Urban Decay has a line of multi-colored glitter liners, perfect for that eye-catching New Years look. Feeling confident enough to cover the whole lid? Apply a glitter eyeshadow from bottom of eyelid to brow line, or blend two different shades. Don’t forget to line the lower lid and inner corners for an eye-opening look. Try M·A·C Glitter eyeshadow in a classic gold or a daring fuchsia, first applying vaseline to the desired area so the glitter will stick. If the eyeshadow is too much with your sequin dress, focus on just your eyelashes with a glittery mascara or even a pair of fake lashes for a bolder look (Sephora’s glitter lashes). Remember, focus on one area to avoid a disco-ball disaster. But don’t forget your glittered top hat and 2010 glasses to bring in the new year! This Halloween, make sure you aren’t frightening your friends with your makeup job! But don’t be afraid to get creative and go all out – your makeup can easily make or break your costume. Simple additions like fake eyelashes or a strong lipstick add an interesting and dramatic pop. A creative and unique look can drastically improve a simple costume. Need a little help? 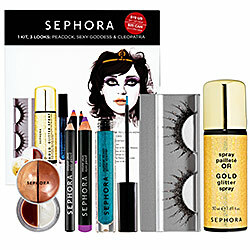 Try Sephora’s Halloween kits, $19 at Sephora.com, designed to provide the best look for any costume, whether its a vicious vampire or a pretty peacock. All of you fashionistas out there know that bright red lips are hot right now, but you may not know that Sephora’s new ruby gloss is venomous! Sephora now carries a shimmery lip plumping gloss by DuWop called Twilight Venom. This scarlet gloss is a lip conditioner with a bite. Its tingly touch heightens the “venomous” sensation and makes your lips look fuller, more defined and irresistibly red. This product combines the original DuWop Lip Venom clear lip plumping serum with a crimson gloss. The two liquids do not mix on their own, but when shaken they create the perfect balance of color and sting. Despite its allusion to the supernatural romance “Twilight”, consumers say this product really does work. Unlike the Cullen clan, Twilight Venom has nothing to hide. Ingredients for this lip gloss include argon, avocado, olive oil and vitamin E.
Although this is the only DuWop product associated with the movie “Twilight”, there is a whole line of DuWop Venom products. You can also try DuWop’s Lash Venom Mascara, Prime Venom lip balm, Reverse Lip Liner and the original Lip Venom lip gloss. So whether you are trying to stay in stride with the latest trends or you want to snag your own Edward Cullen, DuWop’s Twilight Venom may be your new favorite gloss.